Diffraction is a general term for phenomena which can occur when light waves (or other waves) encounters certain structures. Some typical examples for diffraction effects are discussed in the following sections. Although in everyday life one rarely encounters substantial diffraction effects with light, such effects are very common in optics and laser technology. In fact, the operation principles of various optical devices are essentially based on diffraction (→ diffractive optics). Diffraction also plays a crucial role in many other devices, such as optical resonators and fibers. If a light beam (for example a laser beam) encounters some aperture which transmits the light in some regions and blocks it otherwise, the immediate effect on the transmitted light is only the corresponding truncation of the intensity profile. Only after some distance behind the aperture, characteristic diffraction effects can be observed. Figure 1 shows a simulated example, where an originally Gaussian beam has been truncated at a centered circular hard aperture. During the further propagation in air, the intensity profile develops a complicated structure due to diffraction. For a soft aperture (Figure 2), causing a smooth intensity drop at the edge, the diffraction pattern is smoother. Figure 1: Intensity profiles of a light beam directly behind a hard circular aperture (blue curve) and at some distances behind the aperture in steps of 25 mm. The simulation has been done with the software RP Fiber Power. Figure 2: Same as Figure 1, except that a soft aperture is used. Such diffraction effects can be well understood based on Fourier optics. The hard aperture introduces high optical frequencies, corresponding to rapid spatial changes of intensity. Such effects can also occur, for example, when trying to force a laser into single transverse mode operation (for optimum beam quality) by inserting a hard aperture into the laser resonator. Although such an aperture can provide substantially higher round-trip losses for higher-order resonator modes, compared with those for the fundamental mode, it also introduces diffraction effects. Therefore, the method often does not work that well. Most lasers and laser optics are designed such that there are only negligibly weak diffraction effects due to hard apertures. This implies that all laser mirrors, for example, must be so large that essentially the whole beam profile can be reflected. Note that the diffraction effects are intrinsically dependent on the optical wavelength. For polychromatic beams, the resulting spatial patterns can substantially differ between different wavelength components. Therefore, it is possible that one observes colors for a white input beam, for example. The classical case is that of a diffraction grating, which is discussed further below. Even without any aperture, a laser beam always exhibits some amount of diffraction according to its transverse spatial limitation. For Gaussian beams, the shape of the intensity profile is preserved, i.e., it stays Gaussian; only the beam radius gradually increases. This property of preserved intensity profile shapes also applies for other kinds of free-space modes, e.g. to Hermite–Gaussian modes. In general, however, diffraction leads to changes of the shape of the intensity profile, as can be seen e.g. in Figure 1. Laser beams are often diffraction-limited, i.e., their expansion during propagation is not stronger than caused by diffraction alone. Strong diffraction effects occur for light with long wavelengths. For example, difference frequency generation of long-wavelength beams can be severely limited in performance by diffraction of the generated beam, which limits the interaction length or enforce weaker beam focusing. Diffraction alone would tend to widen a beam, as discussed above. Waveguide effects from a refractive index profile of the fiber provide a kind of focusing. For the fiber modes, these two effects exactly balance each other. Similarly, resonator modes exhibit a balance of diffraction and focusing effects, only that the latter are usually lumped rather than distributed in the resonator. Good stability of such modes is achieved when the two counteracting effects are relatively strong, so that any additional effects (e.g. imperfections of a fiber structure, bending of a fiber or misalignment of a resonator element) have comparatively weak effects. Poor stability arises in situations where both effects are weak – for example, in a laser resonator where the Rayleigh length of the beam is much larger than the resonator length. Such situations can arise e.g. when developing Q-switched lasers with large mode radii and short laser resonators. 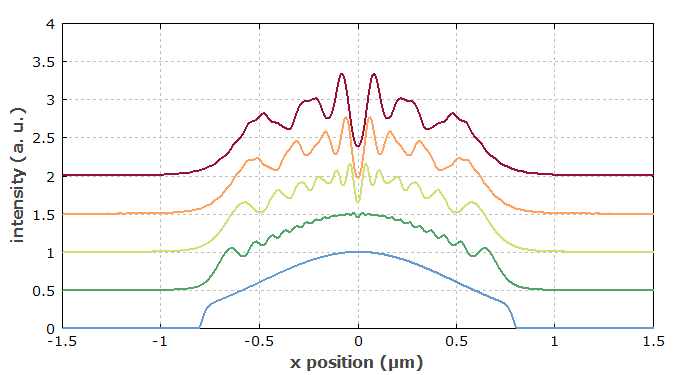 Figure 3: Output beams of all possible diffraction orders at a diffraction grating. Diffraction effects can also occur when a light beam encounters a structure which causes spatially periodic changes of the optical intensity (via a variable absorbance) or of the optical phase (e.g. via a variable refractive index or a height profile). Such structures are called diffraction gratings, and the phenomenon is called Bragg diffraction. If a grating exhibits a large number of oscillations within the beam profile, there can be multiple diffracted output beams (see Figure 2), each of which has a similar spatial shape as the input beam. The beam direction of the output beams (except that of the zero-order beam) are dependent on the optical wavelength. That effect is exploited e.g. in grating spectrometers. Diffraction can also be caused by refractive index modulations in some volume of a medium. For example, there are volume Bragg gratings which can be used as wavelength-dependent reflectors. Also, Bragg diffraction is possible based on sound waves in a medium; this is exploited in acousto-optic modulators. Diffraction effects can also occur in reflection. 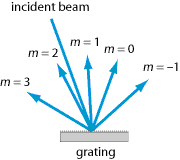 In fact, most diffraction gratings are reflective elements. Of course, diffraction effects also occur at non-periodic structures. For example, the phenomenon of laser speckle occurs when a laser beam is scattered on a rough surface, which in effect causes a complicated phase modulation pattern on the beam. Very noticeable speckle effects can be observed with quasi-monochromatic light as obtained from lasers. This is not the case for broadband (temporally incoherent) light, because the obtained patterns have a strong wavelength dependence, such that the averaging of intensities over some wavelength range effectively washes out such patterns. There are various other kinds of optical elements which exploit diffraction effects. For example, there are diffractive beam splitters with multiple outputs, and similar devices are used for coherent beam combining. For more details, see the article on diffractive optics. 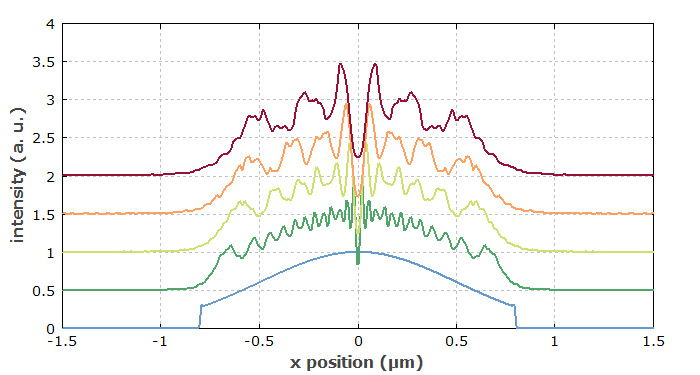 Diffraction effects can be explained based on the interference of different contributions of a field profile to the resulting fields at distant locations (Huygens–Fresnel principle). There is actually no clear boundary between diffraction and interference. For example, the transmission of light through a narrow slit (aperture) is usually described in terms of diffraction, while phenomena behind a double slit are called interference phenomena. However, the basic principle of interference can be applied to both cases. Different regimes of diffraction are distinguished, which can be treated with different mathematical methods. Fraunhofer diffraction is relevant when considering the far field, i.e., diffraction patterns far away from the refracting structure; this regime is characterized by values of the Fresnel number well below 1. On the other hand, the concept of Fresnel diffraction with large Fresnel numbers can be applied to cases where the near field is relevant. The performance of various kinds of optical instruments such as microscopes is essentially limited by diffraction effects. Essentially, the limited transverse size of the entrance aperture or of internal elements cause diffraction effects which set a minimum spot size of the so-called point spread function. Therefore, optical microscopes (including laser microscopes) are usually limited in resolution to the order of half the optical wavelength. There are few exceptions to that limitation, for example near field microscopes (using an optical tip of sub-wavelength size for scanning objects) or certain kinds of fluorescence microscopy (STED). Similar performance limitations apply to optical telescopes. Limiting diffraction effects (for optimum angular resolution) requires the use of large optical apertures.